Yesterday in a post entitled Sharing Information, Misinformation and Untruths I suggested that an article entitled “Flickr is about to sell off your Creative Commons photos” which had a sub-heading providing a warning to Flickr users: “And no, you won’t see a single penny from it“ was being disingenuous as such commercial exploitation has always been available for resources which have a Creative Commons licence which do not have a NC (non-commercial) exclusion. Last night on Twitter I found a number of people agreed with my perspective – if resources have a licence which permits commercial exploitation, you can’t complain if that’s what happens. However today I have read posts such as “What’s wrong with this picture? Flickr is about to sell off your Creative Commons photos” and “I don’t want “Creative Commons by” to mean you can rip me off” from bloggers who are unhappy with Flickr’s announcement. 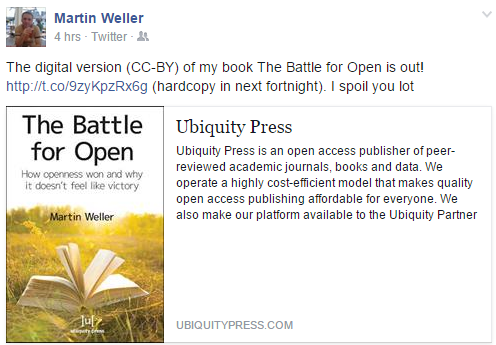 Coincidentally a few hours ago I noticed a Facebook status update from Martin Weller, Professor of Educational Technology at the Open University, in which he announced that his book entitled “The Battle for Open: How openness won and why it doesn’t feel like victory” is now available to download for free – but if you wish to buy the hardcopy you will have to wait for a couple of weeks. This was therefore a timely announcement. I’ve not yet read the book but I have downloaded the PDF and the table of contents for this 244 page book makes it clear that the book is of interest to me, covering topics such as “The Victory of Openness“, “What Sort of Open?“, “Openness Uncovered” and “The Future of Open“. My thoughts on openness are informed by my personal involvement in a number of aspects of open and closed resources in the 1980s and 1990s. In the 1980s whilst working in the Computer Centre at Loughborough University I discovered that the terms and conditions covering use of a engineering package prohibited transfer of the package or its outputs from a list of countries which the US was not on friendly terms with. I can’t remember the full details but I do recall that the list included countries (the USSR and Bulgaria) which I had visited. I wondered whether I should monitor the nationality of users of the software and block access to the software if they were from one of the prohibited countries or, since the terms and conditions didn’t prohibit them from using the software. just from exporting the outputs, ask them to sign a form saying that they wouldn’t take any printouts from the software or export magnetic tapes containing data. That didn’t happen – and I suspect a manager suggested that I ignore the terms and conditions. In 1994 I wrote a handbook on “Running A WWW Service“. The document included a statement that “This work may be copied in its entirety, without modification and with this statement attached“; today this would be covered by a Creative Commons CC-BY-ND licence. I was pleased that the document was mirrored in over a dozen countries, including countries behind the Iron Curtain. During my time as a member of the Advisory group for the Jisc OSS Watch service I learn about how Free Software Licences must be “non-discriminatory” among licensees. Such licences would permit open source software to be used in countries that one may not be on friendly terms with and by organisations which may have business practices which one may disagree with: businesses in Russia and Iraq and companies such as Microsoft, Google and Apple can, and indeed do, freely use open source software. My view is quite simple: if content uses a Creative Commons license which permits commercial exploitation, then it would be inappropriate to complain if such commercial exploitation takes place. One might wish to argue that there is a need for additional Creative Commons licence which enable additional restrictions to be placed on how content may be commercially exploited. But that, to me, would seem to add unnecessary complications and would be difficult to implement and enforce. To put it simply, Creative Commons is about openness for everybody, and not just one’s friends. I’ve shared my thoughts – I’d welcome yours. This entry was posted on 2 Dec 2014 at 5:19 pm	and is filed under openness. You can follow any responses to this entry through the RSS 2.0 feed. You can leave a response, or trackback from your own site.